The Manyflower Puccoon is a member of the Forget-me-not Family. The plant grows to 2 feet in height and has green lance-shaped leaves to 2 inches in length. It typically grows in clearings in pinyon-juniper woodlands and ponderosa pine forests at elevations between 6000 and 9500 feet. Native Americans obtained a purple dye from the roots of the Manyflower Puccoon. 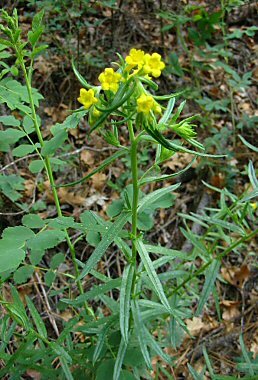 The Manyflower Puccoon blooms between June and September and produces a yellow, funnel shaped flower with 5 rounded petals to 1/2 inch in width.